Tagged under Kinako, Tatsunoko Production, Series. 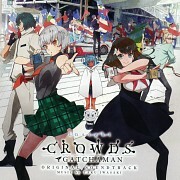 /anime/ Gatchaman Crowds was incredibly fun and enjoyable to watch during its run. It was vibrant, creative, and energetic with its direction, consistently pulling out interesting ideas and concepts that the audience can think on, or not--it never pressures or preaches. It's really one of those series that, after you had time to think about it at its conclusion, simply gets better and better with each reconsideration. Can't wait for the second season. No feedback on Gatchaman Crowds.